I have successfully installed domain mapping plugin for my multisite http://www.iwebsite.ph. But when I tried to map one subdomain site1.iwebsite.ph to workimprovements.com it does not work. On site1.iwebsite.ph under Tools > Domain Mapping I'm entering "workimprovements.com" and clicking Add button. The page refreshes but nothing seems to happen workimprovements.com was not added. I have already added a custom DNS A record and have 173.236.148.220 as its value. Does this mean I need a dedicated IP from my host? which is Dreamhost. I have VPS with them. I checked the IP 173.236.148.220 and its not resolving to my WPMU site. Well it sounds like Dreamhost is getting in the way here. What you need to do is move your domain name (not hosting) to somewhere like GoDaddy who will allow you to fully edit those A records. 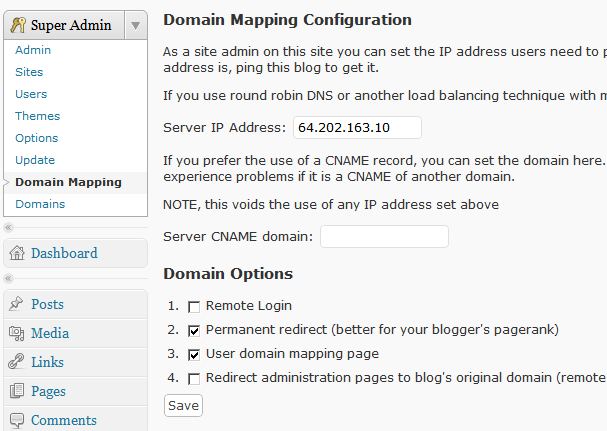 Only then will you be able to point your domain to your WP site and get domain mapping working. So the domain name that I need to move is workimprovements.com right? Btw that domain is with moniker.com not dreamhost. Is it correct to say that for domain mapping to work workimprovements.com should only have one DNS A record with the value set to my VPS's IP address? One thing to note is when I go to the IP 173.236.148.220 I get a bad_httpd_conf error message. Which domain does this DNS record appear for? Both domains are registered with moniker and both are hosted on dreamhost. @kryz2per, I believe that there is something wrong with your httpd.conf configuration. Either the wildcard DNS isn't set right or there is some other misconfiguration. I have used domian mapping a few times and it's a little complicated to setup. I believe I had to park my .com name on the hosting and then go into the DNS record and point the domain.com A record to the new IP address hosting. You may also try emailing your host provider to see if they can do it for you if it won't let you edit it. This is where the problem lies. Dreamhost is forcing that domain to put to your shared hosting. You need to take that domain off shared hosting or transfer it to a different registrar where you can edit all the DNS entries. Hi guys thanks for the help. Would you know if I still need a static IP when I'm now on VPS on Dreamhost? Phil if I edit the DNS of workimprovements.com on moniker and use IP 173.236.148.220 do you think it will work? Also what i find strange is each time I enter a domain name to be mapped and click Add nothing seems to happen. The input box where you enter the domain gets cleared out and the domain name I added does not appear. I'm attaching a screenshot. Is this because I still don't have the domain setup correctly? Because I expect the domain to appear on the list but will just don't work. Yep - you will need a dedicated IP and that's what you need to enter into the domain mapping configuration. It should definitely update when you click add in that page so check that there isn't a conflict with another plugin somewhere. It might be a jQuery conflict. @kryz2per, do you have access to your database to check and see if this table exists? Are you using the multi-db plugin? If so, have you added domain_map to the table list in db-config.php? 2. I used godaddy for the domain and change the zone record there. Thanks for all your help! Really appreciate the support I'm getting here.